1,100+ alumni occupy strategic service positions globally. 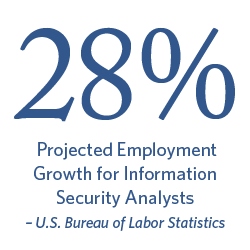 Are you wired to foresee and tackle challenges related to homeland security, counter-terrorism, and national and international intelligence? Sharpen your skills through our online and on-campus Master of Arts in National Security Studies. Choose from in-demand concentrations that allow you to focus your master’s in national security studies program. Prepare for opportunities in the defense industry, military, government, private sector and beyond. Affect change in cybersecurity, military operations, crisis management, diplomacy, strategic intelligence and other areas critical to national security. Identify, analyze, forecast and manage emerging security threats and identify strategic, policy-based security solutions. An analysis of the nature and development of the Israeli political system, including historical background, Zionism, elections and the institutions of government, constitutional issues, and religion and politics. The relationship between domestic politics and foreign policy will also be explored as well as the regional and global context in which Israel exists. Comparative politics seminar. Examines founding and history of Russia, creation of Soviet and later Russian political institutions, problems of post-communism and democratization and future of Russia as a quasi-authoritarian regime. Evaluates theories about the causes of armed conflict and sustainable peace, both intra- and inter-state, with a focus on specific cases over the past one hundred years. Applies the literature on diplomacy, conflict resolution, track 2 diplomacy and peacebuilding, and transitional justice to real-world cases. Studies conventional armaments and weapons of mass destruction and the global efforts to control their spread and reduce their dangers. The course covers policy tools from treaties and diplomacy to sanctions and war. This seminar provides students an analysis of national security topics. Among the topics which may be covered are national security and the role of the law, theoretical approaches to national security and world order, development of the international law of conflict management, the use of force in international relations, the laws of wars and neutrality, war crimes, the international law of intelligence collection, the control of international terrorism, American security doctrine and nuclear weapons. Cross-listed with MLAW 640. Develops an understanding of how national security experts consider key maritime security issues and their trade-offs with other national security priorities as well as how the elements of national power (diplomatic, information, military, economics) are related to U.S. objectives in dealing with threats and vulnerabilities in the maritime sector. Develops an understanding of how national security experts consider key energy and environmental security issues and their trade-offs with other national security priorities as well as how the elements of national power (diplomatic, information, military, economics) are related to U.S. objectives in dealing with threats and vulnerabilities in the energy and environmental sectors. Political change and ideological trends in the Mid-East after WWII. Explores the politics of state and nation building, the legacies of colonialism, the impact of nationalism, the development of civil society, the complications of oil wealth, the challenges of democracy, and the place of political Islam. Political development, post-colonial approaches to understanding democratization, Realist and Critical Theory, state failure, evaluating and critiquing the role of foreign aid providers, and the role of culture in democratization. Deals with Asia’s wars and peace in the 20th century, and the dynamic political, economic, and religious developments in the 21st century. It will also discuss the division and desire for unification of Korea, and China’s rise as a regional and global power. Includes an analysis of ASEAN’s goal to move from economic cooperation to political integration and regional security; and the consideration of the role of APEC and Asia’s future relations with The United States and European Union.